Paul Costelloe was the most magical show of the season, at least for me. I was lucky to win two tickets on the @paul_bakeryuk instagram, which also means I could take my Mum with me. Needless to say she enjoyed it, and so did I. The show took place at The Waldorf Hilton London on the 4th day of LFW. Between a French environment, the designer presented a vintage glamorous collection where pastels, colours and floral prints where the main characters. 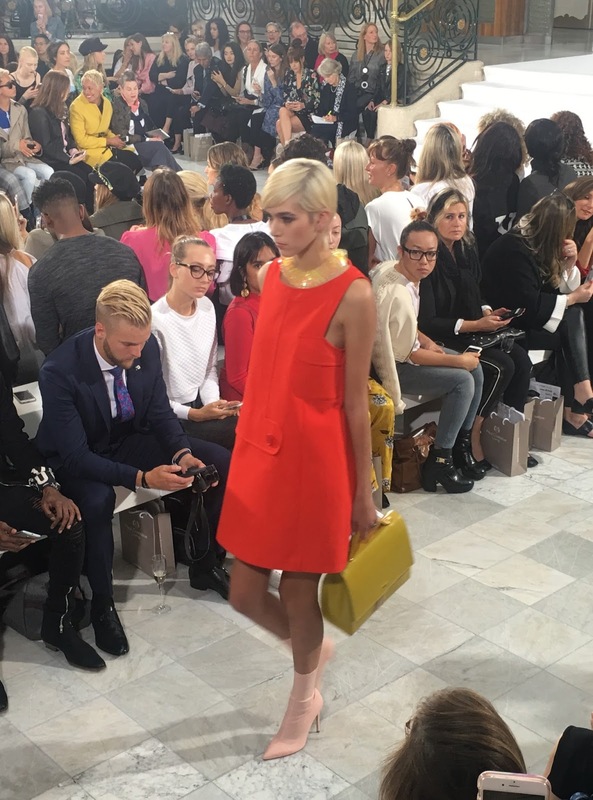 The showed was opened by three models wearing matching tween light orange outfits. A dress, a coat and a skirt and jacket combo. 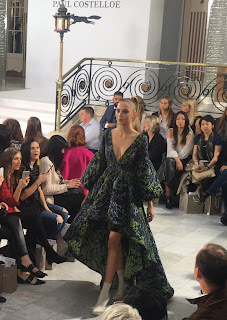 The show continued with similar styles that make me think of the 60´s. It´s inevitable. The A-line dresses and the high necklines are two classics of the time. Then, some looks broke the style. Neon yellow and floral prints spiced up the looks. 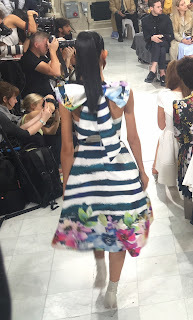 What called my attention the most was an elegant midi dress with navy and white stripes and a floral detail at the end that looked amazing on the front, but it surprised me as the model walked by and showed the finishing detail on the back with a gigantic matching bow. 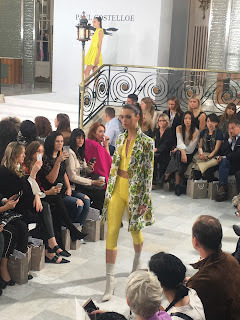 Also, the jumpsuit in pastel shades has to be my favourite look as it sums up all the shades that will be trending next year. So did the menswear looks, that included jackets of all those colours. 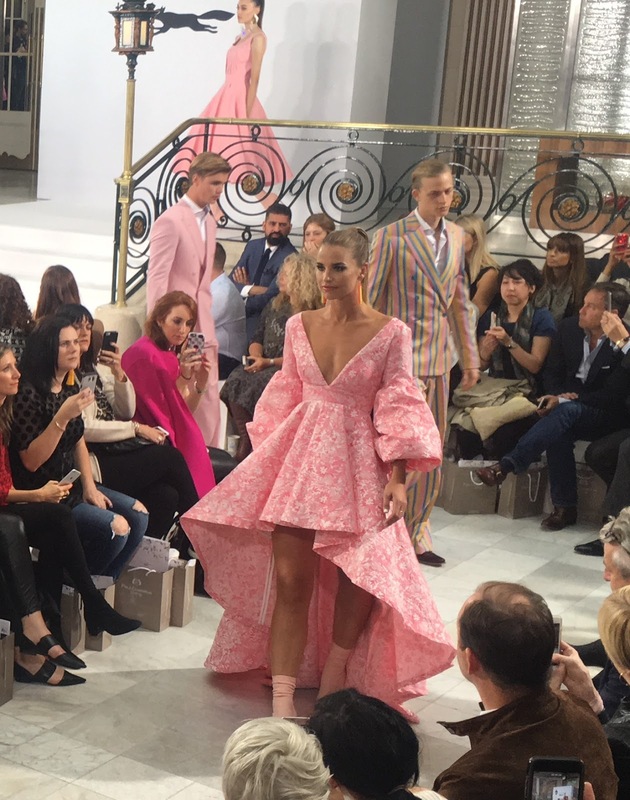 Before the finale, the beautiful Vogue Williams stepped on the runway wearing the most incredible pink gown. It was short on the front and had a long tail at the back. It had 3/4 sleeves that ended in a bell style. The neck was a V-line. The final look was very similar to this but in a darker shade. Less attention grabbing, but equally beautiful, as all the collection. 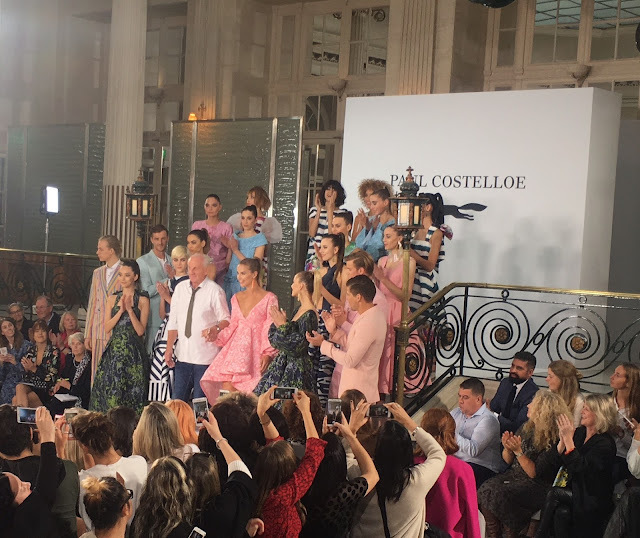 Paul Costelloe is an Irish designer based in London who has been working in the industry for almost 40 years. Paul began his path in the fashion industry at the Chambre Syndicale de la Haute Couture in Paris but found he learnt more just by living in Paris during the era of Ungardo and Cardin. He was then appointed Design Assistant to Jacques Esterel before moving to Milan to support Marks & Spencer in their drive to enter the Italian market. Paul stayed on in Milan as designer for the luxury department store La Rinascente. 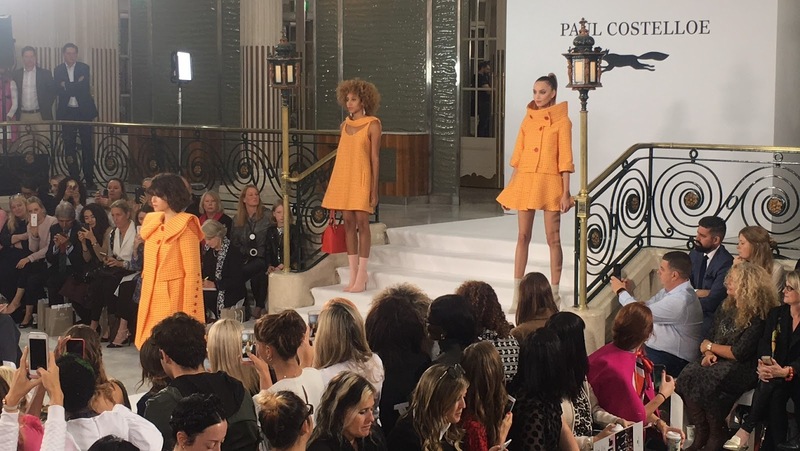 A move to the USA was followed by his appointment as designer to Anne Fogarty in New York after which Paul established his own label, Paul Costelloe Collections. 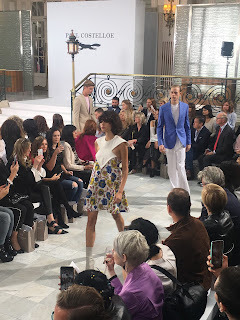 Today, the brand encompasses a wide range of collections including womenswear, menswear, bags and accessories, homeware, jewellery, eyewear and children's occasionwear. But of course, his most renown work comes from being Princess Diana personal designer from 1982 to 1997.